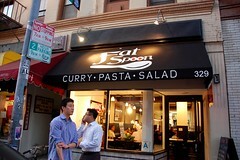 Fat Spoon (329 E. 1st Street, Los Angeles) doesn't have a website yet, but it's not hard to find. It's Daikokuya's new next-door-neighbor! This, however, means that parking may be hard to find. Starchy Marie and I met here at 7 p.m. on Friday and were seated immediately. We both admired this adorable bunny placemat. Is this li'l guy enjoying curry or pasta? 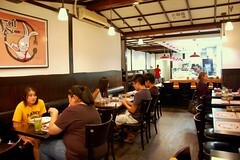 We couldn't tell, so we made sure to try both the Japanese and Italian offerings. 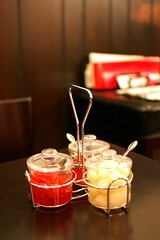 You know you're in Little Tokyo when there are pickled veggies on the table. 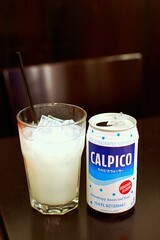 You know I'm in Little Tokyo when I order Calpico ($2.50). Appetizer special of the day -- uni croquettes ($6). 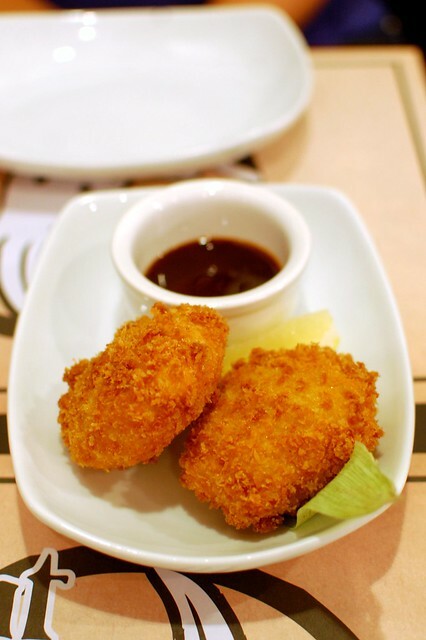 I actually don't love uni, but I do love croquettes. The verdict? I loooooved this! Croquette win! 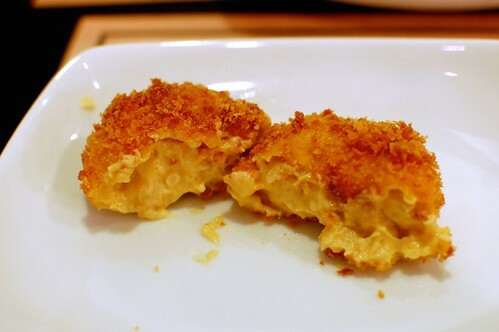 Rich, creamy uni goodness mixed with corn, cradled in hot, golden crunchiness! 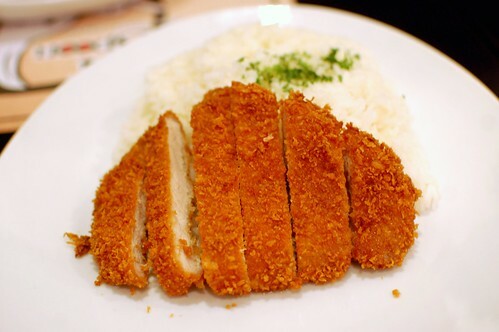 Pork cutlet curry -- crispy fried Kurobuta pork loin ($10). You know that part about hot, golden crunchiness for the croquettes? Well, it's back for the cutlet! Fat Spoon knows how to fry. The pork was juicy and substantial and accompanied by generous portions of both curry and rice. There's enough to drown your plate if that's how you roll! 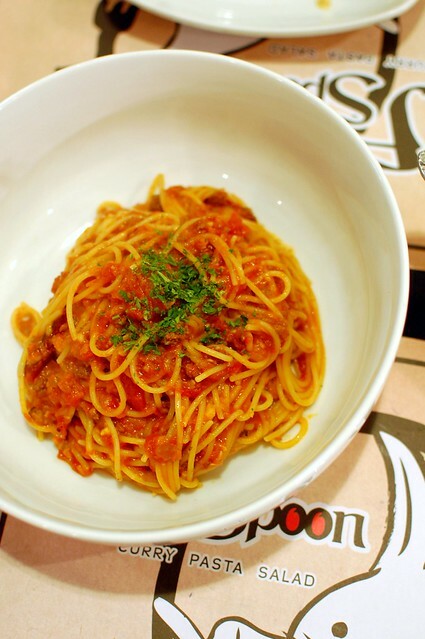 Bolognese -- domestic Kobe beef and vegetables simmered in Pomodoro sauce ($9). Very respectable pasta dish. No surprises. Just the basics made with high-quality ingredients. 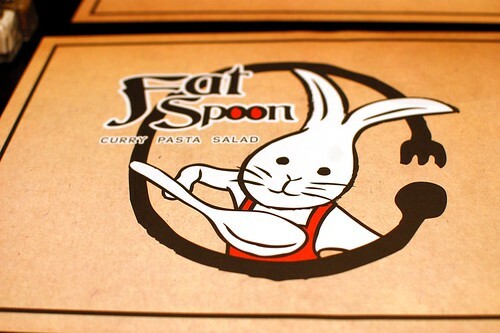 I really liked Fat Spoon. It was simple, tasty, and inexpensive, and the service was fast and friendly. oh boo was gonna try this but didn't get a chance to. UNI CROQUETTES?? Omg ... I die. Do they taste as good as in sushi form when they are cooked? 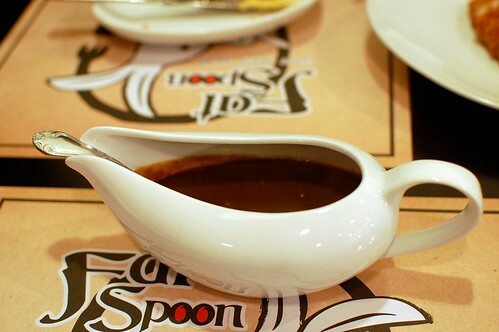 Really enjoyed trying Fat Spoon with you! Was just thinking about the uni croquettes the other day, ha. bolognese with kobe beef? sign me up!